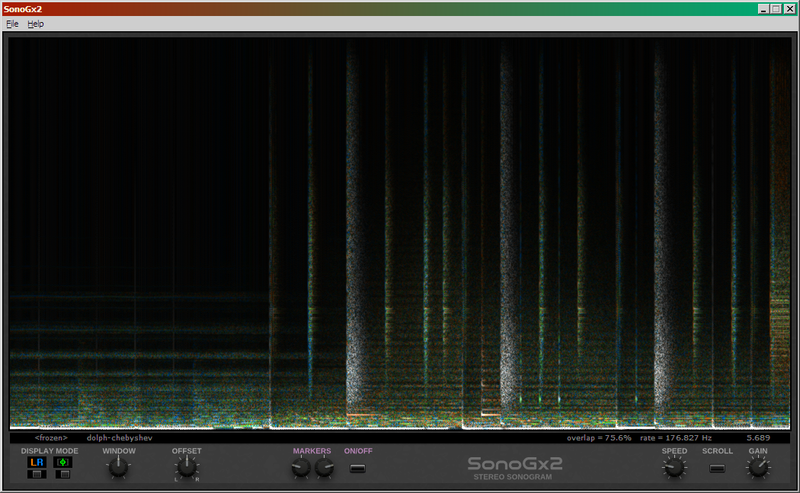 as_SonoGx2 is a stereo sonogram. to show the two audio signals "one on one"
It's most convenient if your soundcard has a "what you hear" (aka Stereo Mix) audio Input Source, which captures everything you hear. This way you can use SonoGx2 while playing music in your favourite media player, or sounds from the browser (youtube, soundcloud, etc..) to "see" how they look like. Use the DirectSound driver in those cases. Minimum system requirements: winXP, sound device with a stereo input source, CPU with SSE/SSE2. Installation: Unzip the archive somewhere. Move the dll to your VstPlugins folder. The standalone version creates a file "settings.ini" in your "appdata" directory (the exact location depends on the OS). Known issues: the standalone program sometimes hangs/freezes when changing the audio settings. The scrolling will be choppy when very big audio buffer lengths are used.